Remove and discard the tops, seeds, and membranes of the eight bell peppers. Arrange peppers in a 9x13 baking dish with the hollowed sides facing upward. (Slice the bottoms of the peppers if necessary so that they will stand upright.) Add 1 Cup water to the bottom of the baking dish and bake approximately 15 minutes (or until the desired tenderness.) 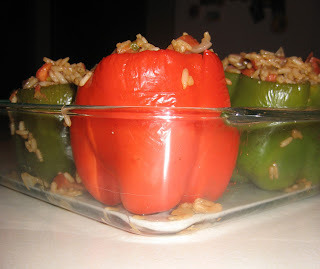 Remove from oven, drain any excess water and return peppers to baking dish. Prepare the Zatarain’s Jambalaya mix per the stove-top package directions and set aside. In a large pan, brown ground Italian sausage until cooked through. Drain the excess fat and set sausage aside in small bowl. Return the pan back to the stove and add the olive oil, onion, garlic, mushrooms, cayenne pepper, pepper, crushed red pepper flakes, and diced green and red peppers. Simmer until tender. (About 10 minutes). Add in shrimp and cook until pink and translucent. (About 6 minutes.) Add in diced jalapeno and simmer another 2 minutes. Stir in jambalaya rice mix and mix thoroughly to blend well. Remove from heat. Spoon mixture into pepper until each pepper is overflowing. Evenly add the cheese to the top of each pepper. Bake until heated through and cheese is melted (Approximately 15 minutes). Remove from oven and drizzle each pepper with marinara sauce, if desired. I have always wanted to give this recipe a go with chorizo... and change it to more of a mexican stuffed pepper but I just haven't found the time. I am sure any way you adapt this recipe to your liking will work out lovely. Enjoy! Cheers to cooking old things new ways! Did you really want to just leave your Italian sausage in that bowl?